(CNN) -- It's one of the largest age gaps between presidential candidates in American history. Only 20 percent of those polled said Sen. John McCain's age would be a factor when they voted in November. To pre-empt those concerns, McCain has allowed reporters -- including CNN chief medical correspondent Dr. Sanjay Gupta -- to look through more than 1,100 pages of his medical records. This spring, McCain's personal physician, Dr. John Eckstein, released a letter saying there is no medical reason "that would preclude McCain from fulfilling all the duties and obligations of the president of the United States." Still, the issue hasn't gone away in the minds of voters. That compares with just 8 percent who said they are "very concerned" about Obama's ability to finish his first term in good health and 11 percent who said they are "somewhat concerned." Obama has not released any medical records; however, his campaign released a statement from his doctor saying he is in "excellent" health. Both the Obama and McCain campaigns say they will not release any additional information or records about the candidates' health. Are voters more concerned about a presidential candidate's health or his age? In the poll, 20 percent of respondents said McCain's age would be a factor when they voted in November. "McCain's age appears to be having the roughly the same effect that Ronald Reagan's age had in 1980," according to Keating Holland, CNN's polling director. "Back then, when Reagan was 69 years old, concerns were raised about his age," Holland said. That obviously didn't prevent Reagan from winning, but then again, the election in 1980 election turned out not to be a particularly close one." A candidate's health is far from the top of voters' concerns. Just 7 percent of those surveyed in the poll said it would be the "single most important factor" in their vote, and 24 percent said it would be "one of several important factors" they would consider. 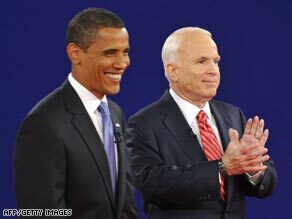 How concerned are voters about McCain's and Obama's medical histories? Of those polled, 33 percent said they would be concerned about the health of a candidate who once had cancer but no longer does; 14 percent said they would be concerned about the health of a former smoker. McCain quit smoking in 1980. Obama quit last year as he launched his presidential campaign but admits he's "bummed" cigarettes since then. The CNN/Opinion Research Corp. Poll also included more hypothetical questions. Eighty-nine percent said they would worry about a candidate who was an alcoholic, and 47 percent said they'd be concerned about a recovered alcoholic. Still, some voters are hard to ruffle. Nearly one in four said they would be "not very concerned" or "not concerned at all" even if a candidate suffered a heart attack during the presidential campaign. The good news for McCain and Obama is that in this election, their health isn't nearly as important to voters as their plans for health care, the economy and the war in Iraq. But in a close race, anything could make the difference.